My husband has been looking for jobs for the last couple of years. However, he hasn’t been looking all that hard. Occasionally, he applies for a job when he finds something in a place that appeals to us. Part of the reason that he has been slow to apply has to do with the fact that we really like where we are. We are prosperous, and we like the vibe in our current locality. Plus, it’s not as though my husband doesn’t have any work. He’s working as an adjunct professor, and even that job comes with some flexibility, even though he isn’t eligible for a benefits package. Since I’m the primary breadwinner for our family, there isn’t a lot of urgency. Why uproot our family and move when we like where we are? In many cases, it’s not really about how much money you can get at a job as it is about how far that money stretches and whether or not your town fits with your personal style and values. For us, living here is ideal, even though we don’t always fit in with the majority. There are cultural experiences, thanks to the university, and we are within an easy distance of a city with an international airport, major and minor league sports teams, and entertainment venues that bring in world-class performances. 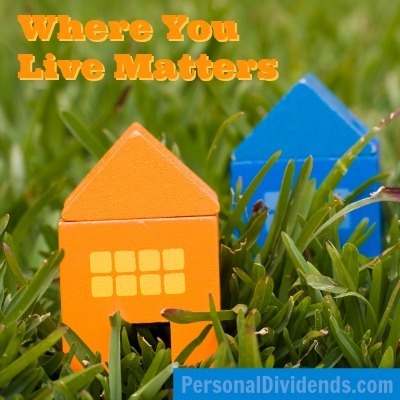 We get small town living, at a very affordable rate, and we have access to many of the benefits of living near a city. It’s this affordability and access that increases our financial and life satisfaction. We can afford to do almost anything that our town offers, and it’s possible for us to have enough left over to travel most places that we want to go. This means that we get to enjoy greater life satisfaction. Plus, we enjoy financial satisfaction since our lifestyle doesn’t break the bank. It’s a nice setup to have. We know that this wouldn’t be possible if we lived in a bigger city. We would need anywhere from twice our current income to four times our current income to make it work. We would have to work a lot more, and we would have to worry more about our son’s safety. Right now, we are fairly confident that our son can grow without too much worry, and we can afford our leisure time without stressing so much about work. A different location might not provide us access to the cultural and entertainment options we like, even though another location might be cheaper. This is about as rural as we can handle, so cheaper living wouldn’t be attractive to us without the options that we currently have. However, a location in a bigger city with higher wages would mean more work, and might not be so friendly on the pocketbook. Before deciding where to settle down, or before you decide to move for a different job, think about the financial and life impacts involved. Look at the pros and cons, and realize that there is more to the equation than a higher salary. You might not be better off if you make a move.